Mamenhara highland（麻綿原高原) is a highland garden, which has over 20,000 Ajisai planted, located between Otaki and Amatsu in Chiba. The top of mountain is about 340m high. 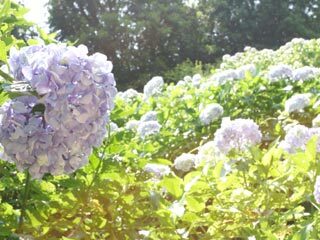 During the season of Ajisai blooming, many people visit this place and enjoy Ajisai. Legend said, one of the highest Buddhist monk, Nichiren had "Satori" at this place. This highland park opended in 1953. It was reused old temple. This is chosen as the 100 best place of sound and landscape because in summer, Japanese balm cricket makes great sound here.